In this episode, the mystery of strange chalk markings on the school field. The Melancholy of Calumon... watch it. In an effort to put some sort of focus in each of these posts, we've been ignoring the two developing subplots that we've gotten snippets of in the first four episodes- Calumon and Hypnos. Hypnos is not in this episode (and yet, another Wild One bio-emerges unchecked... how about that?). But Calumon takes center stage as Takato and Henry meet up with the fun-loving little scamp. In the process, we learn... absolutely nothing about him. It's not like the episode is completely without purpose. The tamers meeting Calumon and establishing him as a partnerless free spirit is important enough. The thing is, we don't know why it's important. We've gotten hints of what Calumon is in episodes two and three when mysterious and unexplainable evolutions happened while he was present. In an episode squarely based around the little guy, a reinforcement of that message would be common sense. Not having an evolution in the battle against Vilemon, on either side, makes us forget about the previous incidents and renders this episode little more than an amusing sidebar. At least it is amusing. Not long after faculty reported seeing a red dinosaur roaming around, the school has another mystery to deal with when some hooligans cover the field with chalk lines. Rather than suspecting your run-of-the-mill vandals, talk turns immediately to sexier theories. Like, say, somebody trying to summon aliens. Someone even suspects time-traveling aliens. No word if espers are involved. The culprit, of course, is Calumon, who sees kids having fun playing soccer and wants in. That night, he strikes again, breaking the “door earring” on the equipment shed (I am calling every padlock I see a “door earring” from now on) and drawing more chalk lines, adding enough twists that it looks less like soccer and more like Calvinball. Calumon dribbles, he shoots... he scores! Nobody leaps out of the bushes and celebrates with him because everyone's asleep. He's very disappointed in this. When Takato and Guilmon find him, he's happy to have some playmates, but Takato and Henry insist on finding him a tamer. This is very curious, as all the tamers introduced so far were tapped by something far greater than a couple of kids with an orphan Digimon. It took a series of strange events that generated a digivice for these two, yet they run with the assumption that if they find a match, the lucky kid will magically receive his or her own. Perhaps from some old guy who runs a clock shop. In the meantime, Calumon out-logics Guilmon (not a difficult task) and convinces him to go for another round of chalking. This resulting creation looks nothing like a soccer field and instead bears a closer resemblance to a SATANIC HEXAGRAM. That may have gotten some airbrush work in the dub. Seriously though, they're lucky it only summoned Vilemon and not goddamn Daemon or somebody stronger. 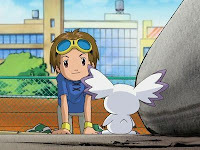 Takato and Henry arrive, and at least Henry's more open to Terriermon fighting this creature. After they accomplish little, Rika shows up, Renamon uses Double Team and kills it to bits. 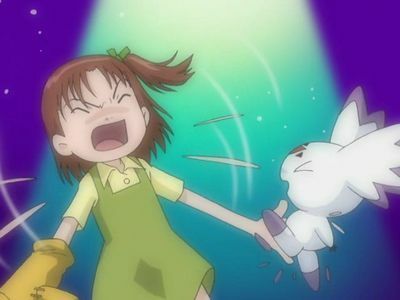 Henry tries to give Rika the business about killing living creatures so heartlessly, but she gives a “Digimon are just data” speech and walks off. Calumon seems to get to her for just a moment, but she shakes it off quickly enough. Takato and Henry dismiss it and Calumon runs off in search of more fun. After all, it won't be the last “Digimon are just data” speech we'll hear. Strangely, it also won't be the last time we see satanic markings on a school field. Wow... two Hunters references in this post. What the hell is going on here? Pointless as Jeri's story about encountering Calumon may be, the embellishments are nice and silly, from the amount of courage she needed to investigate to the size of the monster (though it sure fooled Takato). Thing is, how did she know that thing had any connection to the chalking? Since we've been talking Haruhi, in that show, Jeri's voice actress plays a knife-wielding maniac. Just thought I'd mention it. Calumon must be more savvy to the ways of the world than he lets on. He not only knows that the chalk is kept in the equipment shed, but he also seems to know how to load it into the hopper and enable it. Never mind how he's able to do those things. Let's take a second to analyze why Takato and Henry rejected the potential tamers for Calumon. They rejected Kazu because he's all about offense at the expense of defense. Kazu ends up with a metal robot resistant to damage. They're afraid Suzie will dress up Calumon the way she does Terriermon. She ends up with a Terriermon palette swap. They think Jeri will freak out in terror at the sight of Calumon. She ends up with a giant gruff lion monster. Did Terriermon just say that their problems would all be solved if Guilmon ate Calumon? So yes, the dub totally masked out part of the satanic hexagram that Guilmon and Calumon drew. Funny thing is, the end product of the airbrushing bears a striking resemblance to the symbol on Calumon's forehead. 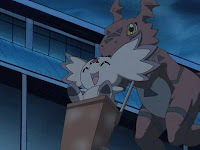 I loved this episode; Calumon/Culumon's antics were just so cute! So as Guilmon and Calumon, very cute!! See, I don't think Jeri's story with Calumon was pointless. Thinking about the rest of the series, I think it set up and established the beginning of the relationship they come to have. Re-watching this episode, I was surprised at all the foreshadowing used in Jeri's description of running into Calumon. I don't know what the vernacular of the original Japanese was, nor do I know how much the Dub Team knew about later events of the show and how far out. Still, very nice touch. Considering your comment on why Jeri wasn't ultimately deemed ill-fit to be Calumon's Tamer and her future partner. I like to point out the Leomon was actually running away from her. Tamers Episode 06: O Partner, Where Art Thou?